Located south of Sparta off of Beulah Cemetery Road. From the Hancock County Courthouse, go east 2 blocks (0.2 mile) on Broad St. to Boland Street. Turn right on Boland Street (which eventually becomes Linton Rd) and go about 8-1/2 miles to the Linton - Beulah Highway split. Bear right on Beulah Highway and go 2.9 miles to the intersection of Beulah Cemetery Rd and Beulah Highway. Turn left on Beulah Cemetery Road. Go approximately 0.3 mile. Turn left on a dirt driveway; an old barn stands beside the driveway. The cemetery is 0.3 mile down the dirt driveway and not visible from Beulah Cemetery Rd. Graves numbered 400 and higher have been added since the original survey and are believed to be located somewhere within the cemetery. A second marker has date as Dec 27, 1915. On same gravestone as Annie Lois Webster. Age 21 years. Funeral home marker. On same gravestone as Flora R. Primas. On same gravestone as John T. Primas. Death day may be 4. Difficult to read. Death month and day hard to read. Day may be 28. First name difficult to read. Last digit of death date hard to read. Stone broken at birth date. No 'e' on the end of the last name. A star on her grave may mean that she was an Eastern Star. "Beloved Mother"
"Sister" "Beloved Wife and Mother" Venus Chap 41A O.E.S. P.M. H.H. Olga O.R. 2234 S.G.R. O.M.C. R.S.C. 2. O.E.S. M. of AD. JUV 5-point star and sheath of wheat emblem. Birth year difficult to read. Name hard to read and may be something else. Entire gravestone difficult to read. An adult-sized slab. Death day hard to read. An infant slab with no dates. Last name spelled Travick, but probably should be Trawick. Death date hard to read. 1905 could be birth year and death year, but slab is adult-sized. 2 gravestones, with a different first name (Geneva / Genevn) on each. "Beloved wife". On same gravestone Bennie Franks Warren Sr.
"Beloved husband" On same gravestone as Johnette C. Warren. An adult-sized grave. No dates given. Possibly a 3rd but unreadable name on this gravestone. First letter of first name unclear. Birth year might be 1884. A new grave as of June 2002. On same headstone as Gussie Butts. On same headstone as Emanuel Butts. Only one date on gravestone. Death date assumed. Last name spelled as "Gardon". 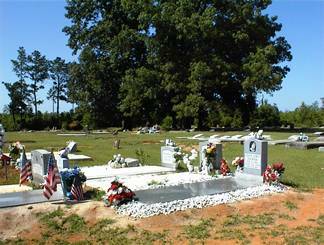 A new grave as of June, 2002. Stone broken and fallen in. Birth year could be 1929. Difficult to read. Only one date on stone. Death date assumed. Difficult to read, but last name spelled 'Chadler'. Birth day difficult to read. Nothing else but the name is readable. Possibly as many as 20 graves. "Gone to a bright home where grief cannot come" On same gravestone as Murray J. Harper. On the same gravestone as Anna Harper. h/o Kizzie Thomas. "He died as he lived, a Christian"
"Died in the truth". Located at the foot of Lawrence Thomas. Year hard to read. Possibly a child. No last name readable. Possibly a child. Birth day may be 24. Death day may be 25. Entire gravestone difficult to read. First name difficult to read and could be Nellie or Willie. In enclosed area with an adult slab. Writing worn away and illegible. Last digit of death year unreadable. No death date. An adult-sized slab. Not found. All info from Kimbrough list. May be same as T. J. Lewis in the listing above. Not found. Name from Kimbrough list. Age 52. Of Brooklyn, NY, per obituary. Age 79. All info from obituary. Age 49. All info from obituary. J. C. Clinton Brown, Jr.
Age 67. All info from obituary. Age 100. All info from obituary. Age 28. All info from obituary. Age 33. All info from obituary.